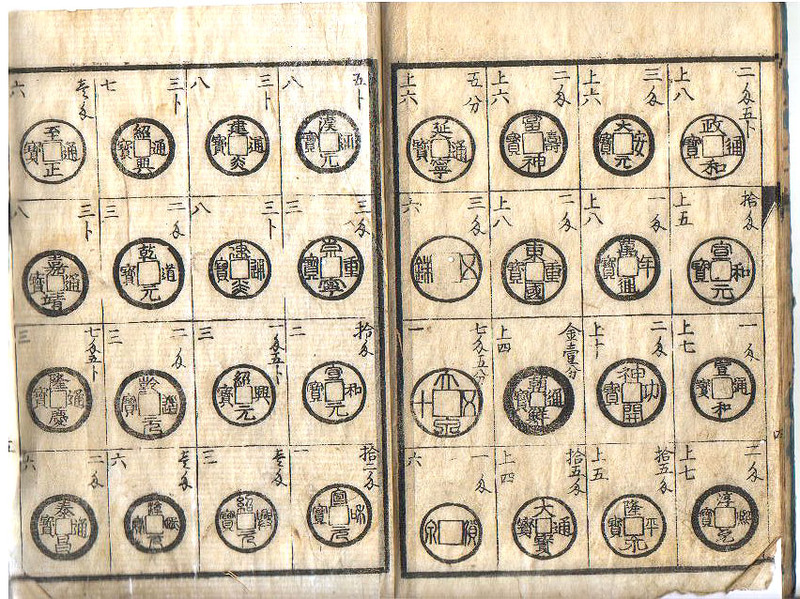 This is the fifth page of Shinpan kaisei, Kosen nedantsuke, Narabi ni bantsuki (Improved New Edition: Price List of Old Coins, Together with Rarity Ranking), printed in the city of Nagoya in 1799. This book belongs to the collector Sam Leung who kindly provided me with the images and allowed me to present these at my site here. These are all coins manufactured in dynasties within the bounds of modern China but thre is not much chronological order. Because each page file is a large JPG (around 200K each) I have made a separate web page for each of the11 pages of the book. Use this bar to navigate to the page you want. Use the cover image in the green rectangle to navigate to the top page.